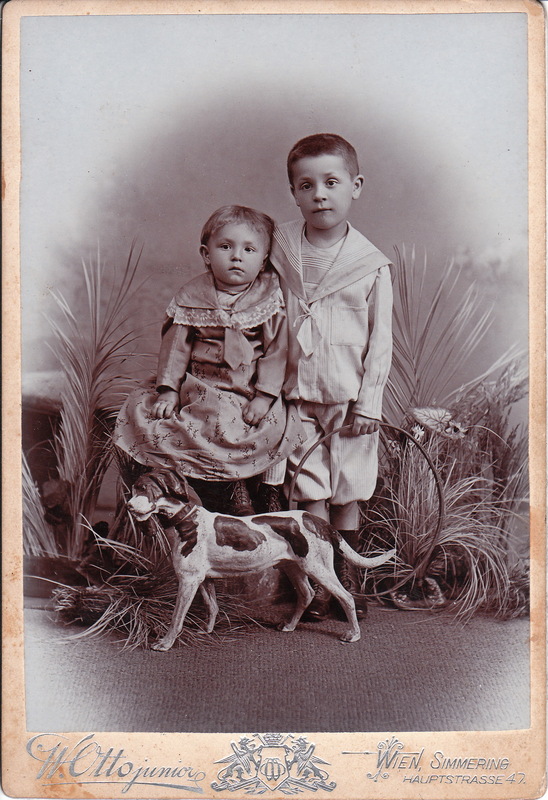 This cabinet card features two siblings posing with a fake dog. The dog, and perhaps the ring toy held by the older child, were provided by the photographer, Wilhelm Otto Jr. Otto’s photographic studio was located in Vienna, Austria. One can see the advantages of a fake dog versus a real dog from the perspective of the photographer. Children were difficult enough to photograph; dogs behaving like dogs were likely a photographers nightmare. Talking about nightmares, the children do not seem to be having too much fun having their portrait taken. I think they were scared of the fake dog – I would have been!